Is The Eagles Offensive Line Quietly Even Worse Than Last Year? 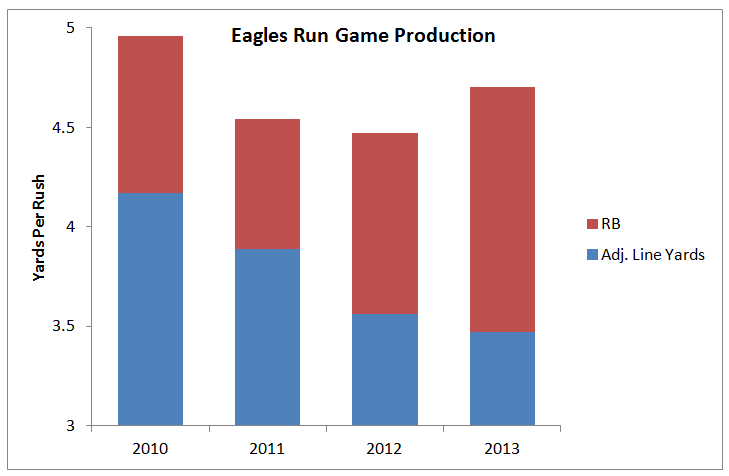 The Eagles rushing attack is pretty great. The offense leads the league in total rushing yards (2140) and average per carry (5.0). Football Outsiders grades them out as the top DVOA rushing offense with +20.1%, head and shoulders above second-place Dallas at +10.9%. A piece of that action has come on quarterback runs. Michael Vick is second in the NFL in rushing DYAR despite having only played in parts of six games. Banged up at age 33, he has the highest rushing DVOA of his career, a ridiculous +68.1%. Even slowpoke Nick Foles places 7th in rushing DYAR and 9th in DVOA, showing the power of the zone read. "I think LeSean is trying to press too much and trying to hit a home run on every play instead of letting it develop," Kelly said. The comment was fairly innocuous, as any observer could point out a couple plays every game where McCoy tries to out-juke just one too many defenders, or cut back one too many times. But ultimately McCoy is a Barry Sanders-esque force of nature in the backfield, and he's bailing out Chip's offense and his blockers up front much more than the other way around. See, the truth according to the advanced stats runs somewhat contrary to the conventional wisdom. Not that anyone is particularly discounting McCoy's contribution to the offense. But there has been a lot of praise heaped on the zone read and a rejuvenated offensive line for the success of the run game. It's not completely misplaced. Certainly we've seen the Jason Peters, Evan Mathis and Jason Kelce dominate blocks at times. Todd Herremans appears to be fading with age, and Lane Johnson makes some rookie mistakes, but they're important athletic pieces in the blocking scheme. Since 2010, when McCoy took over as the featured back, the rushing attack has been stellar. High per-rush averages, great power success (that's short yardage, high leverage plays), and elite 2nd level and open field gains. The consistency of those stats is shocking compared to the overall decline in Football Outsiders' signature stat of Adjusted Line Yards. That metric weights runs by distance, attempting to isolate the offensive line's performance over the early yards vs. the largely running back-driven yards down the field. McCoy has always generated a healthy performance bump above what his offensive line provides him, but this year is the greatest difference yet. Some of that is a higher rushing average than the last two years, but Eagles running backs are actually behind their 2010 pace. The difference is that the offensive line has only "generated" 3.47 yards per rush, 0.6 yards per rush less than 2010. The gradual decline over the last three years comes despite no major change in power or stuffed rank. And the 2nd level and open field yards are as good as ever for McCoy. Plus, the offensive line isn't doing so hot in pass protection either. The adjusted sack rate is actually worse than last year, despite a distinct lack of starting games by noted turnstile Danny Watkins. None of these stats are perfect, but the overall picture isn't jiving with the public narrative of a rejuvenated offensive line. And that's partially to be expected. The Eagles had the eight-oldest starting offensive line coming into the season, despite starting a 23-year-old rookie. The Giants are the only other team to rely on three starters over 30. Normally you would worry about injuries with an aging offensive line, but due to either #sportscience or good luck, the Eagles front five have been remarkably injury-free. They just haven't been as productive. Despite controlling their own playoff destiny, this team has a lot of obvious holes. But when everyone's screaming for more pass rushers and defensive backs this offseason, don't be surprised if the Eagles make a push for young offensive line help. It's secretly one of the team's largest problems. Tagged with Philadelphia Eagles, nfl, Offensive Line, LeSean McCoy, Running Game, Football Outsiders, Statistics, DVOA, Adjusted Line Yards, Sacks, Age, Jason Kelce, Jason Peters, Evan Mathis, Todd Herremans, Lane Johnson, Danny Watkins, Chip Kelly, Michael Vick, Nick Foles. December 19, 2013 by Brian Solomon.